FINALLY, HEARING PROTECTION THAT WORKS! is working for your employees? A: If it's not a measured hearing protector you can't possibly know. protection doesn't work when they have a hearing test. Then it's far too late. Noise induced hearing loss is permanent - but it is preventable. to calibrate the Hearing Protector for that person's noise exposure level. This missing part of the equation in a Hearing Conservation Program can lead to Noise Induced Hearing Loss for the employee and litigation for the employer. Traditional plug and muff Hearing Protection can not be measured and therefore does not adequately fulfill the requirements of a Total Hearing Conservation Program. With Sonomax you get on the spot fitting. You give us immediate feedback on your comfort. Soft, formed protection that is easy to keep clean. 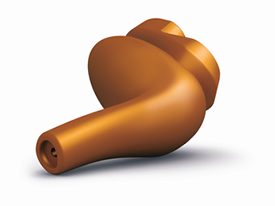 We are leading the world in the measurement of hearing protection. inside of your Sonomax and produces a written report on your own protection level. No more risk of under protection. Once the testing is complete we match your protection level with the noise level you are exposed to. We then use acoustic dampers to adjust your Sonomax to the exact level you need. No more risk of over protection.